The shadow of the 2008 fiscal crisis and the resulting Great Recession infuses this highly technical economic study with a deep sense of purpose. The author notes, “prior to the 2007 fiscal crisis, the income share of the top 1 per cent in the US expanded from 9.4 per cent in 1980 to a staggering 22.6 per cent in 2007.” Mazzucato adds, most pessimistically, that the growing concentration of wealth is not a solely American phenomenon: “In 2015 the combined wealth of the planet’s 62 richest individuals was estimated to be about the same as that of the bottom half of the world’s population—3.5 billion people.” Her study is deeply informed by the history of economic thought and how we got where we are today. It provides a scholarly outline of the evolution of the economic theory of value. To this end, she draws on the thinking of a broad range of scholars, including Adam Smith and Karl Marx, John Maynard Keynes and Friedrich Hayek, to Paul Samuelson and Thomas Piketty. 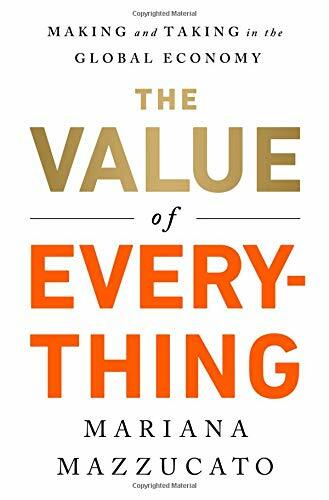 Her analysis focuses on three critical issues involved in the transformation of value. First, how “finance” has evolved since the mercantile era of the 17th century until, in today’s 21st century world, it has been globalized. Second, how government has become a principle vehicle for the financialization of the market economy, but its role is not acknowledged as adding value nor is a share of value created returned to the public coffers. Finally, these developments have led to what Mazzucato sees as the economy shifting “from creating value for the benefit of all to the extraction of value for the owners of assets, and the consequences in terms of steady economic decline and worsening income inequality.” She argues that in the mid-19th century, economist shifted their analytic approach from one in which value determined price to one in which price began to determine value. “until the 1960s, finance was not widely considered a ‘productive’ part of the economy. . . . In around 1970, however, things started to change. The national accounts—which provide a statistical picture of the size, composition and direction of an economy—began to include the financial sector in their calculations of GDP [Gross Domestic Product], the total value of the goods and services produced by the economy in question.” This development led to the rise of the dominate role of the monopoly sectors within modern capitalist economies, with value extractors dominating value creators. Mazzucato uses the experience of Apple to illustrate how this process has played out over time. She reminds readers that the company “initially received $500,000 from the U.S. Small Business Investment Corporation (SBIC), a public financing arm of the government.” As it grew, the company shifted production to China and other overseas—and less costly—territories. She details how it exploits tax loopholes, including holding, in 2015, $187 billion in overseas safe harbor (mostly in Ireland) and by channeling U.S. profits to Nevada in order to avoid California taxes. Another illustration of this process, the author examines the role of SBIC loans and grants to the pharmaceutical sector during periods when venture capital investment become more “short-termist.” “Indeed,” she points out, “it turns out that 75 per cent of the most innovative drugs owe their funding not to pharmaceutical giants or to venture capital but to that of the National Institutes of Health (NIH). The NIH has, over the past decade, invested $600 billion in the biotech-pharma knowledge base; $32 billion in 2012 alone.” Her critique goes deeper, arguing “the issue is not just the size of the financial sector, and how it has outpaced the growth of the non-financial economy (e.g. industry), but its effect on the behavior of the rest of the economy, large parts of which have been “financialized.” Mazzucato overall critique would have been strengthened had she analyzed the role of what Pres. Eisenhower famously identified as the “military-industrial complex.” Whether in the U.S. or Britain, government financing of “defense” spending has fostered a permeant war economy in which the public “investment” in the military is privatized for corporate gain. How well intentioned are Mazzucato’s proposals? One is left asking, If not, what happens next?